Just a short comment today. I was getting some charts together to discuss the ugly Canadian July Labour Force Survey, but it appears the data were so ugly that they were wrong. The data will be re-released on Friday, August 15 (at least my charts are ready). I will instead make some comments about the global bond market rally. The chart above gives an example of the rally in global bonds this year. Euro area yields are now at JGB-esque levels. My gut feeling is that bond bears were over-extended going into the low volume summer season, and they were easy prey for a squeeze on geopolitical concerns. Meanwhile, equity markets have been relatively resilient. I do not see that as too surprising; the main risk that fund sponsors worry about is under-performance risk. Absent concrete reasons to get out of equities, no one is willing to do so. As I discussed earlier in "Nuclear Weapons & Monetary Policy", this complacency in the face of geopolitical risk is not too surprising. The consequences of escalation are stark, and so the base case scenario remains that the developed countries will follow the precedent of the cold war (that is, avoiding direct conflict). But the possibility remains that the geopolitical worries will push an already weak euro area further into recession. I believe that the hawks' analysis of the amount of excess capacity in the economy is off, but the current pricing of bond yields is perhaps too complacent. The U.S. economy is still expanding, albeit at a sluggish pace. 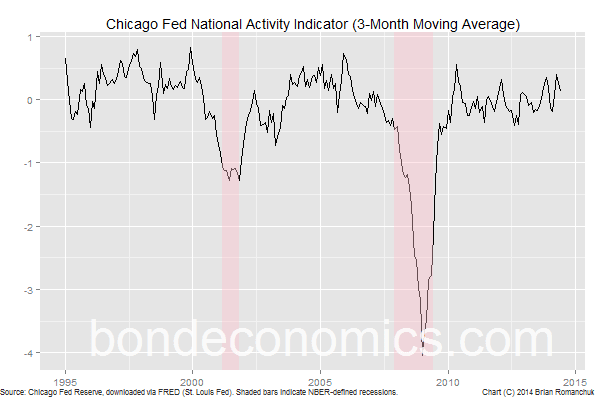 Although it is not the most timely of indicators, the Chicago Fed National Activity Indicator (chart above) is not showing particular weakness. However, I would not be surprised that rates would grind lower if there is no sign of a thaw in global political tensions. 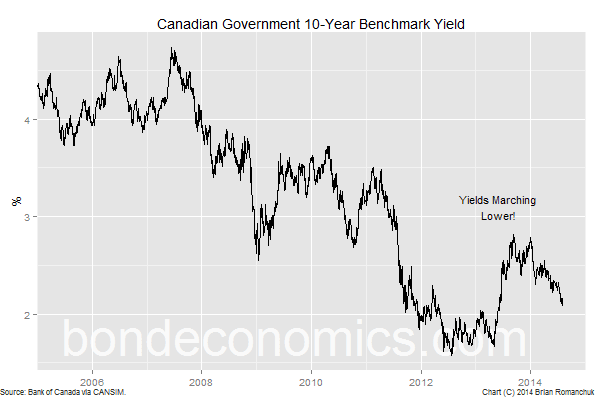 Finally, I hope to update my charts of the Canadian economy when the labour market data have been corrected.